Welcome to Today@WKU, the daily newsletter from WKU Public Affairs, for October 16, 2018. 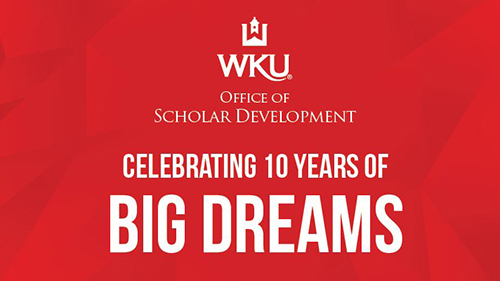 Office of Scholar Development Celebrates Ten Years of Big Dreams: The 2018-19 academic year marks the 10th year since the Office of Scholar Development at WKU was created. Established in 2008, OSD helps WKU students apply for and win nationally competitive scholarships. Over its 10-year history, OSD has helped WKU students and alumni earn recognition more than 450 times and more than $4.8 million in national scholarships. WKU Forensics Team wins two tournaments at Ball State: The WKU Forensics Team traveled to Muncie, Indiana, to compete in two tournaments co-hosted by Ball State University and Illinois State University the weekend of Oct.13-14. WKU won the team sweepstakes championships at both tournaments, ahead of 17 other schools, including the University of Texas at Austin, Bradley University and the University of Illinois at Chicago. The team won 14 individual championships in all, and senior Lane Hedrick was named the overall champion of the second tournament. Opening Reception for WKU Stickwork Project: WKU’s Cultural Enhancement Series and the Kentucky Museum invite you to an opening reception for the Stickwork Project at WKU featuring artist Patrick Dougherty will be Friday (Oct. 19) in the Kentucky Room. The reception begins at 5:30 p.m. with remarks at 6. WKU Week in Photos: Oct. 8-12, 2018: Check out the latest installment of WKU Week in Photos by Clinton Lewis and Bryan Lemon of WKU Public Affairs on WKU's Facebook page. Volleyball: WKU Headed to Austin Peay to Close Non-Conference Play: WKU Volleyball will close out its non-conference slate tonight against Austin Peay in Clarksville, Tenn. The Govs enter the midweek tilt with a 17-3 record while the Lady Toppers own a 14-7 overall mark. First serve from the Winfield Dunn Center will go up at 6 p.m. CT.
Men’s golf: Bevington's Career Day Leads Hilltoppers at Georgia State: Junior Tom Bevington fired a career-low 67 in the second round Monday at Georgia State's Autotrader Collegiate Classic, leading WKU Hilltopper Golf heading into the final day. Bevington is tied for 17th individually with a two-round tally of 140 (73-67) accumulated Monday at the par-72, 6,706-yard Berkeley Hills Country Club. The 140 is also a new 36-hole career best for the St. Albans, England, native. Football: Weekly Press Conference: Coach Mike Sanford and defensive coordinator Clayton White discuss Saturday’s game against Old Dominion. WKU writing celebration will honor late professor: After her death in June, this year’s Celebration of Writing at WKU will honor the legacy of Mary Ellen Miller, WKU’s poet laureate and longest-serving faculty member. “This is a celebration of her work and her life,” said English Department head Robert Hale, who remembers Miller as a professor dedicated to her students during her 50 years teaching at WKU. 9 a.m.: Weaving Workshop: Introduction to Weaving with Honeysuckle. Kentucky Museum Classroom II. Contact Lynne Ferguson, (270) 745-2594. 11:30 a.m.: Society for Lifelong Learning Food for Thought Series: The Fiedler Tradition by Jeffrey Reed, music director for Orchestra Kentucky. Knicely Conference Center. Contact Cindy Ehresman, (270) 745-1912. 12:30 p.m.: Women Entrepreneurs Week Panel Discussion. Grise Hall’s Guillaume Auditorium. Contact Center for Entrepreneurship and Innovation, (270) 745-4142. 1 p.m.: Potter College Fall Festival. Ivan Wilson Fine Arts Center Amphitheatre. Contact Potter College, (270) 745-2344. 5 p.m.: WKU Softball vs. Volunteer State Community College, doubleheader. WKU Softball Field. Contact Athletic Communications, (270) 745-4298. 6:30 p.m.: Gender Images & Sustainability Fall Film Series: Leave No Trace. Cherry Hall, room 125. Contact Gender & Women’s Studies, (270) 745-6477. 7:30 p.m.: Octubafest. Ivan Wilson Fine Arts Center Recital Hall. Contact Music, (270) 745-3751.